Laryngeal paralysis is a condition in which the muscles that open the voice box become weakened due to a degenerative disease of the nerves and muscles. This results in difficulty breathing, especially during stress or on hot humid days. This condition eventually will affect all muscles of the body, which can cause generalized weakness and swallowing difficulty. Most dogs that develop laryngeal paralysis are geriatric, large breed dogs. Occasionally this problem is seen in young, large breed dogs, and the cause is an inherited genetic disease. This problem uncommonly affects cats. The larynx is know as the voice box. It consists of the vocal cords, which allow vocalization, and the cartilages that provide the semi flexible structure of the larynx. The arytenoid cartilages form the structural “doors” of the larynx. The glottis is the doorway of the airway of the larynx through which air passes from the mouth into the windpipe and then into the lungs. There are two sets of muscles that attach on the arytenoid cartilages that control the larynx. One set of muscles serves to open the “doors” and the other set closes the “doors.” The epiglottis is a flap or valve that flips over the larynx during swallowing to help prevent aspiration of food or water into the windpipe. Signs of laryngeal paralysis are more apparent in humid, hot weather and include exercise intolerance, difficulty breathing in (inspiratory dyspnea), and raspy or noisy breathing sounds. In severe cases, exercise or excitement may cause a dog to develop a blue or gray color of the tongue or gums due to a lack of oxygen. Collapse and subsequent death may occur if the problem is untreated. Cats initially may display signs of hoarse purring, which may progress to exercise intolerance. In order to examine the larynx, your companion will be lightly anesthetized. As the pet breathes in and out, the function of the larynx is evaluated. When the dog breathes in, the negative pressure from the windpipe will pull the arytenoid cartilages together, thus compromising the size of the glottis. This is how a diagnosis of laryngeal paralysis is made. Additional testing may include a complete blood count, full chemistry profile, urinalysis, chest and neck X-rays, and a thyroid hormone profile. A major contraindication for surgery is swallowing difficulties or regurgitation, as these dogs are at risk to develop pneumonia after surgery. It is therefore very important that you inform the surgeon of any of these problems that your dog may be experiencing. General anesthesia is induced and the throat is examined again to confirm a diagnosis of laryngeal paralysis and rule out tumors that may be obstructing airflow. The side of the neck (usually the left) is shaved. An incision is made on the side of the neck over the larynx. Two permanent sutures are used to replace the paralyzed muscle that pulls the arytenoid cartilage back to open the glottis. This is called a laryngeal tie-back surgery. 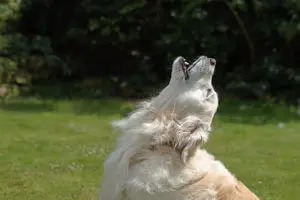 Most pets do well following laryngeal surgery. Breathing is greatly improved, and your pet should not get into a breathing crisis again. Your pet likely will not be able to bark again or the bark will be hoarse. 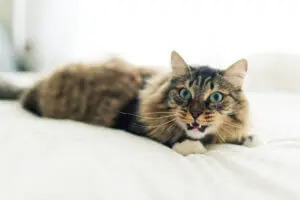 During heavy panting your pet could still have increased respiratory noise, as only one side of the larynx has been tied open and the other vocal cord may flutter as air moves in and out.